The Wild Weasel moniker isn’t exclusive to the F-4G Phantom; it is rather a code name used by the USAF to call any type of aircraft that’s outfitted with radar-seeking missiles and are tasked to destroy the enemy’s radars and surface-to-air-missile installations. The F-4G, which had its maiden flight on December 6, 1965, was the Wild Weasel version of the F-4 Phantom II family. There were 116 F-4Gs making up the Wild Weasel line. Originally, these aircraft were McDonnell Douglas F-4 Phantom E models converted by the USAF. These modified models still carried the excellent characteristics of a warfighter combined with top performance specs. The F-4G Wild Weasels were widely used in the Operation Desert Storm. The last operational flight of the F-4G Phantom Wild Weasel was on April 1996, but you can still remember its great contribution to U.S. aviation and to the world history as well through this amazingly detailed aircraft replica. Made by expert model makers based on scale drawings, you are assured of an actual representation of the original. Yes, even the smallest details and markings of this model aircraft are done elaborately and accurately. 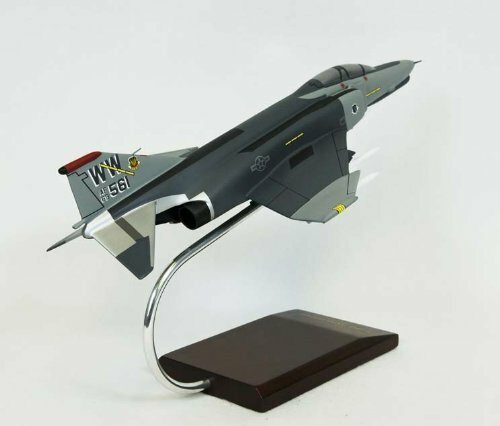 So if you want to have a piece of history with you, this desktop model aircraft is perfect.